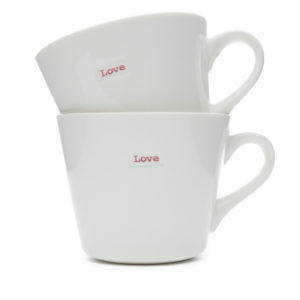 Don’t be shy to express yourself with statement ceramics! Newly available, this Tatty Devine Lobster mug is made from the finest quality porcelain, holds 350ml and boasts wacky Tatty Devine features. Perhaps the most well-known motif by Tatty Devine, the red lobster is one cool crustacean! It was designed back in 2004 to celebrate the Tatty Devine creator’s love of the seaside and affinity with waves and seafood. Initially on a giant statement necklace with real snapping pincers, the loveable red lobster has made its way onto contemporary ceramics. The lobster is displayed in a prominent deep red which coordinates with the funky red interior and contrasts with the white mug background and gold lustre brand stamp. This Tatty Devine Lobster mug was designed collaboratively in the UK by MAKE International’s Head of Design, Keith Brymer Jones, and the Tatty Devine creators, Rosie and Harriet. The perfect combo, Keith produced the mug’s shape and form whilst Rosie and Harriet designed the eye-catching surface pattern. Perfect as a designer gift presented in a jet-black branded gift box, this Lobster mug makes cuppas so much more stylish and bags more fun. Bright enough as a standalone mug but incredible accompanied by the other Tatty Devine mugs featuring everything from wildlife to astronomy, art, feminism and food! Please don’t put any Tatty Devine mugs in the microwave, there’s metal in the gold lustre and we know what metal plus microwaves mean!